Six women, on opposite sides of the earth, yet forever joined by a café in Kabul. Sunny, its former proprietor and the new owner of the Screaming Peacock Vineyard in the Pacific Northwest. But can she handle the challenges of life on her own? Yazmina, the young mother who now runs the cafe, until a terrifying event strikes at the heart of her family, and business . . .
Layla and Kat, two Afghan teenagers in America, both at war with the cultures that shaped them . . .
Zara, a young woman about to be forced into a marriage with a man she despises, with devastating consequences for all . . . These five women are about to learn what Halajan, Yazmina’s rebellious mother-in-law, has known all along: that when the world as you know it disappears, you find a new way to survive . 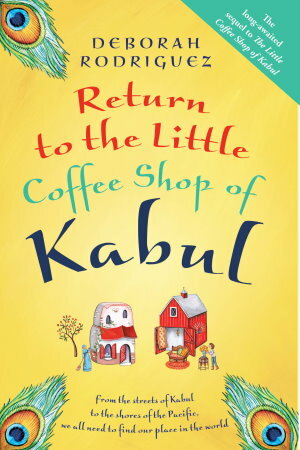 . .
Reuniting us with many of the compelling characters from the international bestseller The Little Coffee Shop of Kabul, Deborah Rodriguez offers up another spell-binding story of strength and courage in a world where happily-ever-afters aren’t as simple as they seem.